C’mon, Who Really Wrote it? : Richard Cohen in 1953. 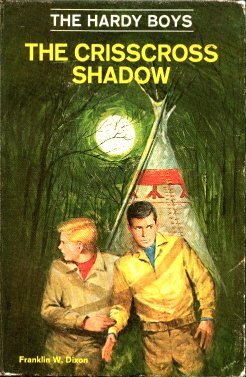 His one and only Hardy Boys book. Cover: Rudy Nappi. We continue in the green period, but there is plenty of yellow and some red too. This is more of an abstract cover as the scene is a thematically accurate depiction of something that doesn’t occur like that in the book. That is, the crisscross shadow does NOT go across Frank and Joe’s bodies. And unlike other covers that give away the plot, this one only sort of does that (as you will see when you read the book) A decent cover. Where’s Fenton This Time? : Here, there and everywhere. It’s odd, he keeps sending messages from all over, but isn’t there. Which Chums Show Up? : Chet, Biff, Tony, Callie, Iola. What’s Chet’s Hobby This Time? : None. At this point he’s merely the third Hardy Boy. Well, maybe football is the hobby in this book. Aunt Gertrude’s Dessert: Chocolate walnut cake, and you can just taste it, can’t you? Plot: Swindlers try to cheat a Native American tribe out of their land, Frank and Joe save the day. Review: This is an odd book in that when it was written in the 1950s, it probably felt very progressive in its views on Native Americans. They even make fun of stereotypical speech while having the tribe talk quite normally, act quite normally, etc. Well done, right? Wellll….no, there is still racism. Frank and Joe solve the mystery by using basic common sense. So why couldn’t the tribe figure this one out? Why does it always take the white folks to be the saviors? See what I mean? A deeper level of racism. Oh well, it tried. The mystery itself is so-so, football comes in at the end, there are some moments of good suspense. It’s OK.